Victims of head injuries are often unaware that they have sustained such a traumatic injury, as the debilitating symptoms as sometimes hidden and the physical evidence of an injury is absent. In fact, even first responders and emergency room doctors may initially miss a closed head injury if they do not order the proper tests. Nonetheless, unfortunately, there are around 570,000 people in the United States that suffer from a closed head injury each year. Sadly, victims may have life-long conditions related to the head injury, including the inability to work, enjoy life, and recall special past memories or even routine daily events. Victims can suffer closed head injuries in many different events, such as construction accidents, car accidents, bicycle accidents, pedestrian accidents, slip and falls, motorcycle accidents, MBTA train and bus accidents, and other blows to the head. In any event, medical costs and rehabilitation times are often grueling for victims and their families. Closed head injuries may also require vocational and speech therapy, sometimes spanning many months. A closed head injury, sometimes referred to as a "non-missile head injury," occurs when a person suffers an injury to the brain and the skull is not broken or penetrated. The most common type of closed head injury is concussion. Concussions may resolve shortly after medical treatment or their effects can linger for months or even years. Brain contusions are another type of head injury, resulting from localized bruising of the brain. A severe and debilitation brain injury, diffuse axonal injury, results in motor skills impairments, speech impairment, mood changes, cognitive difficulties, and major interruptions to work and daily activities. Finally, a hematoma occurs when the brain collides with the skull and results in internal bleeding. Symptoms of a closed head injury include confusion, forgetfulness, nausea, headaches, restlessness, memory loss, depression, etc. Often, signs and symptoms are not immediately apparent and sometimes are intermittent in intensity. Victims may experience difficulty communicating or carrying on conversation. 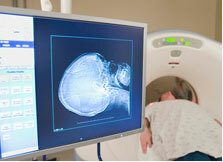 Closed head injuries may also prevent a victim from recalling past events or even daily tasks. Head injuries can cause a number of severe complications for victims and their families, including seizures, communication difficulties, nerve damage, cognitive difficulties, loss of motor skills, diminished reasoning ability, mood changes, coma, post-concussion syndrome, and wrongful death. In short, they can be completely life-altering and affect victims and their families physically, emotionally, mentally, financially, and in every aspect of life. If you or a loved one has suffered a closed head injury because of the negligence of another person, call the experience Boston personal injury lawyers at Bellotti Law Group, P.C. today at 617-225-2100. We have helped countless victims and their families restore a sense of normalcy and recover their medical bills, lost wages, pain and suffering.